Born: Majorca, Spain, December 1965. Education: Left school at the age of 12 to work on the family farm. Career: Teamed with American tailor Douglas Hobbs to launch clothing line Dugg, 1995; opened boutique, Horn, in New York's East Village, 1995-99; launched first collection Manaus-Chiapas-NYC, 1999; launched second collection, Midtown, 2000; received financial backing from the Pegasus Apparel Group to produce Miguel Adrover line, 2000. Awards: Council of Fashion Designers, Best New Designer of the Year, 2000. Miguel Adrover, spring 2001 collection. Hume, Marion, "Miguel Takes Manhattan," in Harper's Bazaar, May 2000. Bee, Deborah, "Uniform Chic Puts Avant Garde Into Everyday Wear," in The Guardian, 19 September 2000. 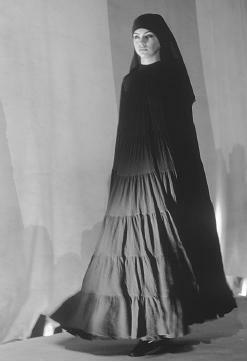 Moore, Beth, "Rebel Designers Deconstruct Fashion Genres, Assumptions," in the Los Angeles Times, 22 September 2000. Goldstein, Lauren, "From New York, Miguel Adrover's Moneyed Moment," in Time, October 2000. Jones, Rose Apodace, "Educating Adrover," in Women's Wear Daily, 2 October 2000. Wilson, Eric, "The School of Miguel," in Women's Wear Daily, 2February 2001. McCants, Leonard, and Julee Greenberg, "Gritty and Pretty: A New Niche Emerges in NYC's East Village," in Women's Wear Daily, 13 February 2001. Miguel Adrover, fall 2001 collection. Menkes, Suzy, "Adrover's Egyptian Odyssey," in the International Herald Tribune, 13 February 2001. Porter, Charlie, "Designer Storms Fashion Desert," in The Guardian, 13 February 2001. Thurman, Judith, "Combat Fatique," in the New Yorker, March 2001. Collins, James, "One Year Later," in the New Yorker, April 2001. Morra, Bernadette, "Designer Gives New Life to Old Classics," in the Toronto Star, 21 September 2001. Miguel Adrover is a self-trained fashion designer who quit school at the age of 12 to work on the family farm located on the island of Majorca, Spain, in a small village called Calonge. His first inspiration into the fashion world came when he visited London as a teenager, where he was exposed to punk rock and the New Romantics. In his village, he became the one who was always into the latest music and punky clothes. He served in the army in his late teens and upon discharge ran a bar in Spain. On his first visit to New York in 1991, Adrover decided to stay. He worked as a janitor and lived in a tiny basement apartment. Four years later, in 1995, he befriended a Native American tailor, Douglas Hobbs, and together they made and sold t-shirts. The same year, they opened the Horn boutique in New York's East Village. Horn soon became the playing ground for young designers from New York and London who didn't have any other place to show their clothes. These designers included Alexander McQueen, Bernadette Corporation, and Bless. Horn also carried labels such as Dugg, Bruce, and As Four. Adrover and Hobbs closed the boutique in March 1999 to concentrate on designing women's clothing. With many friends but little money, Adrover turned out his first collection, Manaus-Chiapas NYC, at a Latin theater in New York's Lower East Side in the summer of 1999. The collection was about the journey of a woman, kicked out of her surroundings, who is struggling yet nonetheless very strong. Adrover received some favorable press, but could not afford and did not attempt to market the clothes since he had only $5 in his pocket. Although he was a newcomer to the world of fashion, he was seen as a rising star after his showing. 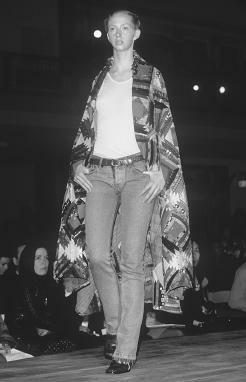 His second show, for fall 2000, took place in a rundown theater in the Lower East Side in February and was titled "Midtown." Adrover wanted to show the paradox of different classes of people mixing on the sidewalks of New York City, where one finds middle-class, homeless, and upper-class people. The show's theme was his interpretation of pedestrians on the streets, and drew many of the fashion world's most important people, including Anna Wintour, chief editor of American Vogue, and Cathy Horyn, fashion journalist for the New York Times. The Midtown showing had been financed by Vogue, who paid Adrover a settlement of $12,000 after his samples were stolen from the magazine's offices. The collection was made up of borrowed classics from past designers which Adrover turned into works of art, using deconstruction and reconstruction. He flipped Burberry macs inside out, took a Louis Vuitton bag and made it into a miniskirt, and transformed writer and neighbor Quentin Crisp's mattress into an overcoat. The coat has become somewhat of a legend in itself—since everyone who worked on it developed a terrible rash. After the Midtown show, Adrover was suddenly the next superstar fashion designer. He was soon signed by the Pegasus Group, and Judith Thurman of the New Yorker called him "a phenom." The eponymous Miguel Adrover collection debuted in May 2000 to high praise and was sold to stores worldwide. Adrover went to Italy to buy his fabrics, from old bolts of cloth, for the 36-piece collection. Adrover's designs can now be found in stores in the U.S., Europe, and the Far East. In February 2001, Adrover showed his fourth collection, "Meeteast," an Egyptian-inspired presentation for which he spend six weeks in Egypt in order to develop ideas. The showing was a trip around the Arab world, filled with exotic designs, and like his previous collections, received much media hype—though not all positive. Meeteast was somewhat of an oddity in the fashion world, featuring military looks with traditional Arab, colonial, and missionary garments. Models wore harem pants, tunics, and supple knits; some fabrics had been soaked in the Nile River to alter their color while also allowing Adrover to make a political statement about the Third World. Adrover is a rising star in the fashion industry, another retelling in the classic story of the American dream. "I would love to be considered a classic," the designer told W magazine, yet his version of "classic" would surely have a twist, as he aspires to be "a modern classic, an abstract classic."